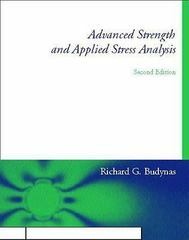 Advanced Strength and Applied Stress Analysis 2 Edition This book provides a broad and comprehensive coverage of the theoretical, experimental, and numerical techniques employed in the field of stress analysis. Designed to provide a clear transition from the topics of elementary to advanced mechanics of materials. Its broad range of coverage allows instructors to easily select many different topics for use in one or more courses. The highly readable writing style and mathematical clarity of the first edition are continued in this edition. Major revisions in this edition include: an expanded coverage of three-dimensional stress/strain transformations; additional topics from the theory of elasticity; examples and problems which test the mastery of the prerequisite elementary topics; clarified and additional topics from advanced mechanics of materials; new sections on fracture mechanics and structural stability; a completely rewritten chapter on the finite element method; a new chapter on finite element modeling techniques employed in practice when using commercial FEM software; and a significant increase in the number of end of chapter exercise problems some of which are oriented towards computer applications.